Mount Fuji viewed from Satta mountain pass., Satta toge no Fuji. Published by Watanabe (seal lower right margin) Showa 10 (1935). 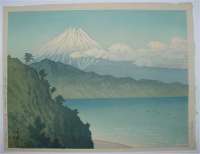 Hasui produced a number of variant (colour) impressions of this design. Perfect impression, colour and condition. Signed Hasui with Kawase seal.